Dolphins defensive back Michael Thomas knocks the ball away from New England wide receiver Danny Amendola in Sunday's game. The Dolphins defeated the Patriots 24-20. Dolphins cornerback Michael Thomas’ whirlwind story added another chapter Wednesday. After deciding to check his phone during a break in between meetings, Thomas received a text from his college roommate at Stanford, Corey Gatewood, congratulating him on an award. Soon after more messages began piling in letting him know he was named AFC Defensive Player of the Week for his performance in Miami’s 24-20 victory over the visiting Patriots on Sunday. Thomas, who arrived in South Florida last Tuesday after the Dolphins acquired him from the 49ers practice squad, recorded two tackles, two passes defensed and the game-clinching interception in the end zone. The 24-year-old was making his NFL debut and had no reps in practice leading up to the game. His only duty heading into the matchup was punt coverage. 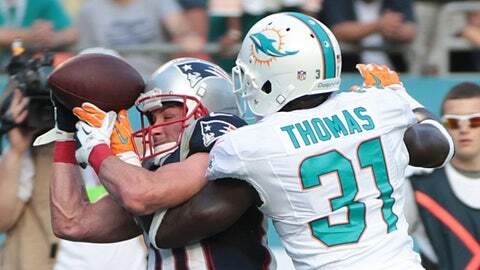 When Brent Grimes and Nolan Carroll exited with injuries, however, Thomas was thrust into the secondary. Thomas joins Olivier Vernon (Week 13) and Cameron Wake (Week 9) as Miami’s recipients of the honor this season. Check out The FINSIDERS on FOXSportsFlorida.com for exclusive Dolphins video, news and commentary.